You can place it at any corner of your kitchen and stack your pots and pans, holds up to 30 lbs. Cookware not included. 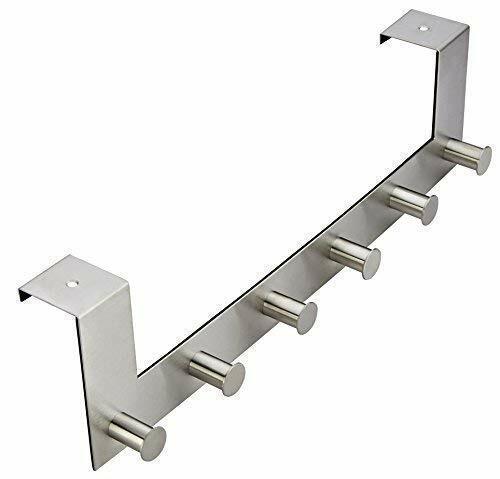 Save as much kitchen space with Range Kleens 2-Shelf Wall-Mounted Pot Rack. Ideal for any kitchen sizes, the pot rack also gives you a good display view of your pots and pans, just in the magazines. 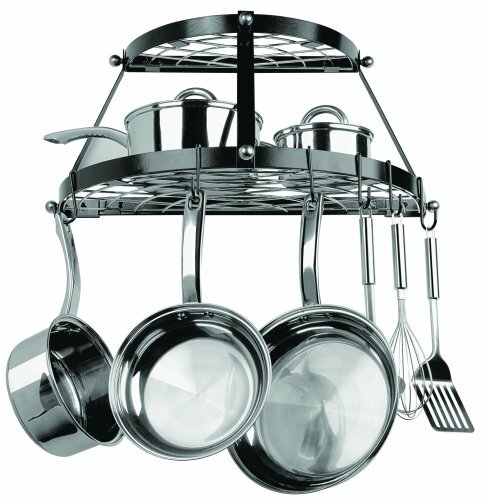 Pot Rack Set includes: 1 x Small Semi Circle Frame, 1 x Large Semi Circle Frame, 1 x Small Grid Shelf, 1 x Large Grid Shelf, 3 x Posts, 6 x Decorative Ball Screws, 8 x Rack Hooks, 3 x Wall Anchors, and 3 x Wall Screws. Cookware not included.Dimensions: 24 inches width x 11.875 inches diameter x 12 inches heightWith 5-Year Limited Household WarrantySave as much kitchen space with Range Kleen’s 2-Shelf Wall-Mounted Pot Rack. Ideal for any kitchen sizes, the pot rack also gives you a good display view of your pots and pans, just like in the magazines. With its black enamel coating, this metal pot rack surely matches perfectly with any kitchen’s color scheme. Perfect as a housewarming present or for someone who simply loves flipping their kitchen. - DURABLE MATERIAL: Made with powder-coated steel, this 2-shelf pot rack is intended for long-lasting use. The coating protects the rack from rust and stains, maintaining its peak quality for a very long time. - EASY INSTALLATION: This pot rack is already pre-assembled, saves you the hassle of thinking about how to put it up. Just hang it anywhere and you're good to go. - BIG ROOM FOR STORAGE: The pot rack is designed with 2 shelves, giving you a lot of space for your pots, pans, and other kitchen helpers. - SAFE STACKING: With the 8 repositionable hooks included in the package, you can place your cookware in a safe way without causing any damage to each one of them. It is also conveniently shaped into oval to complement your cookware's round bottom, not wasting any unnecessary edged space. Warranty Limited lifetime household warranty Tough durable construction and fine workmanship details are confidently backed by the manufacturer's risk-free lifetime replacement warranty that covers any defect in materials or craftsmanship in your investment when purchased from authorized sellers.